It’s never too late to get braces, no matter your age or stage of life. Thanks to modern options in orthodontics, it’s easier than ever to improve the alignment of your bite without wearing visible metal hardware. Invisalign offers a subtle alternative to brackets and wires, and many adults are eligible for this orthodontic treatment. Keep reading to learn how Invisalign works and whether or not it’s right for you today! 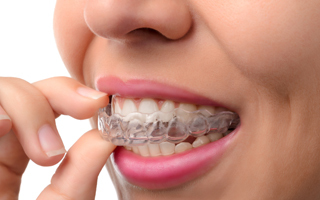 Invisalign is an orthodontic treatment that uses a series of clear plastic aligners to reposition the teeth. It employs the same basic orthodontic principle as conventional braces — gradual movement through focused pressure — without the need for visible hardware. The Invisalign aligners are removable, so you can eat what you like and brush and floss your teeth as normal throughout your treatment. And, as long as you are wearing the trays for the recommended 20 to 22 hours each day, you can feel free to remove them before limited special occasions as well, like big meetings or important presentations. In this way, Invisalign offers greater flexibility than fixed braces. The total cost of your Invisalign treatment will depend on a few factors, including the complexity of your case and how well you comply with the instructions. Breaking an aligner or not wearing them for the recommended amount of time will likely result in delayed treatment and additional expense. People who have more complex cases requiring longer treatment times will also have to pay a little more for additional materials and visits to the dentist. Most treatments are complete in about a year. Living with Invisalign is not so different from life before clear braces. Simply wear the trays for the majority of the day and at night, taking them out only to brush and floss your teeth as well as before meals or when drinking anything other than water. Make sure you rinse the aligners each time they are removed and then again before you reinsert them. Clean the aligners with the Invisalign cleanser or mild hand soap at least once a day to keep them fresh. Excellent oral hygiene is more important than ever with Invisalign. 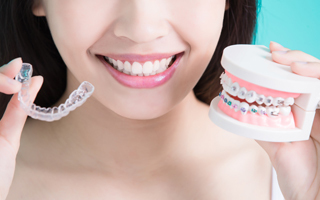 The aligners fit snugly around your teeth, meaning any loose food particles or bacteria can easily become trapped between the plastic and your tooth enamel, accelerating the rate of decay. Brush and floss your teeth thoroughly after each meal. You will need to wear each set of aligners for one to two weeks before advancing to the next in the series, depending on our recommendation. To avoid delays, do not hesitate to let your dentist know if you damage or misplace an aligner during the treatment. With new materials available, Invisalign can straighten your teeth faster than ever before! Invisalign is not able to address all orthodontic issues. Problems such as a severe bite misalignment will require another kind of treatment. While Invisalign can work for younger adolescent patients, it does require a bit of self-discipline to be completely effective, so a patient’s maturity is a factor as well. Dr. Burdusi and Dr. Betts will be able to tell you if Invisalign is the right treatment for you (or your teenager) at a consultation appointment. If you are interested in how clear braces can transform your smile, we can’t wait to discuss Invisalign! Please do not hesitate to get in touch with your dentist in Harbor East. For your convenience, you can request an appointment online today!